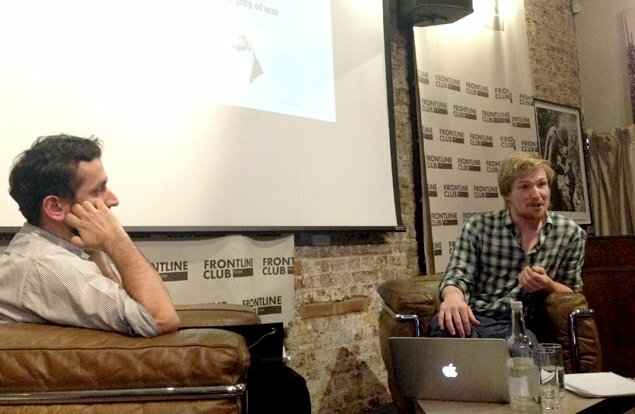 At the Frontline Club on Wednesday 16 April illustrator George Butler and features editor for The Guardian and editor of the G2 supplement Malik Meer discussed whether there is room for supposedly more subjective and abstract illustration in hard-news when photography dominates. “Drawing offers the viewer, the audience, a different perspective. It encapsulates the passing of time in one image, those two or three hours, say, on the street just observing quietly in the corner . . . are invaluable. . . . I didn’t want to go to Aleppo to compete with the photographers, who do a fantastic job capturing the frontline for the front page, . . . I wanted to offer a different angle, a more human fourth dimension . . . to capture a period of time and then distil it into one image. Do you think people react differently to an illustrator than to a photographer who just shoots a photo and leaves? “I see it as a very open and honest process, one where people can see over your shoulder see what you’re doing, they recognise their friends, the places that they work. . . . Importantly, they don’t feel threatened. They’re not made to feel uncomfortable or made to pose. . . . What this means is you’re very often afforded access to places that you wouldn’t otherwise be allowed to see. 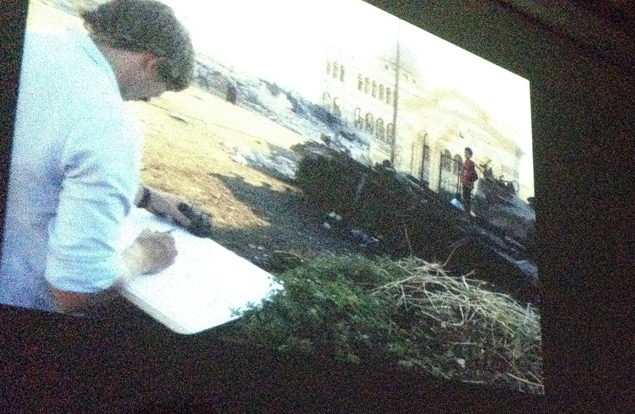 Great lecture at the @frontlineclub with @george_butler last night. Fantastic and inspiring artwork. Well worth the trip. An audience member asked, does the activity of drawing act as a barrier, to put some of the emotions you have towards the scene into something? Can illustrations ever be as powerful as photographs? But with illustration being such a subjective art form and Butler himself having admitted he leaves things out of an image or brings scenes to the forefront, where does he think the line between style and story should be drawn? It could be said that because they are such beautiful pictures that they lend a fairy tale-like quality to what is a very present war?